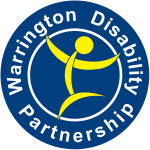 Warrington Disability Partnership provides information, advice and a bespoke service for disabled people, their families and carers. Service and advice is available about independent living equipment, direct payments, personal assistants, payroll, employment advice, volunteering and much more. Find out more about the WDP's Centre for Independent Living.